I keep on finding old pictures that I want to talk about so if you are bored by this stuff – I apologise. I have started getting my loft ready for some 21st century insulation and that means getting every last box and filing cabinet out… and of course that means having a peak in them as you go. The two piers in my home town of Bournemouth have played a huge part in my life and in my photography. My family spent a huge amount of time during the summer months on the beach and I used to play the arcades with my pocket money when Boscombe Pier had a building on the end which housed all manner of slot machines and one-armed bandits. 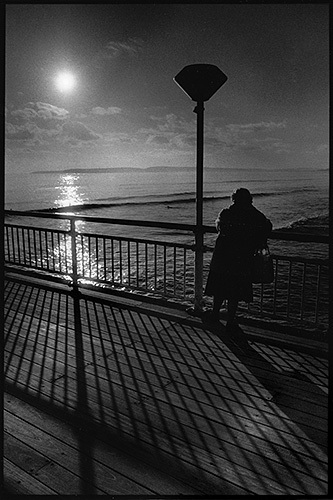 This picture is, I guess, street photography but on a pier. It was taken on the day that I first used a truly wide angle lens on a Leica M6 – the 28mm f2.8. I would guess that it was October 1988 and I spent a lot of time wandering around just shooting for the fun of it. The roll of Tri-X film that this frame is on holds a wide variety of pictures but this has always been my favourite. The shot has no big meaning – just a pensioner enjoying the late afternoon sunshine but it never fails to make me smile.